Cloud-top flashes imaged by Lyudmila Zinkova at San Francisco, October '05. That on the left is a deep emerald green, the one on the right has some blue. ©2005 Lyudmila Zinkova, shown with permission. 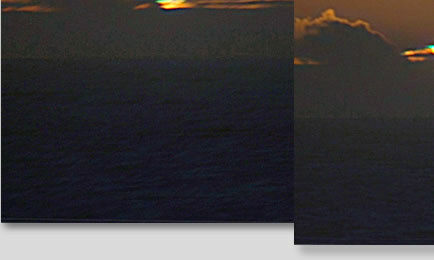 Do not assume when the horizon is cloudy that a green flash will not be seen. 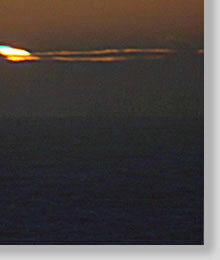 Sometimes a rare cloud-top flash can occur as the sun sinks behind a distant cloud bank. They are not fully understood but might be a type of mock-mirage flash produced by an inversion layer overlaying the clouds. We need more observations and associated weather data to understand them better.